Hidden inside the historic Fairmont Olympic Hotel in downtown Seattle, is a boutique beauty bar that regular spa-goers swear by. Penelope and the Beauty Bar is a Seattle-favorite among many for their mani-pedis, lash extensions, sugaring, facials, body wraps, massages, bridal parties...the list goes on! To be honest, I went into my spa day not entirely knowing what I was having done, but trusting the judgement of the professionals and their suggestions. After changing into a robe and slippers, I went into the waiting room where I was offered tea and water and was warmly greeted by my esthetician, Angelina. We went into the treatment room and started the body wrap. After applying a thick coat of their Glow Mask cream all over my body, she wrapped me in sheets, towels, plastic wrap, and finally an infrared blanket that kept things quite toasty! While I was cooking like a nice baked potato, she started my facial. First cleansing, then toning and applying a mask, I was well taken care of, using incredible French skincare products! Moving on to the Cool Lift treatment, she turned on another machine that was a bit like a mini air jet. Simultaneously shooting oxygen and hyaluronic acid into my skin, I was left glowing with very plump, hydrated, and rejuvenated skin. Finishing up my facial with a few serums and moisturizers, we then hatched my cocoon which was THE MOST refreshing feeling, after baking away in a sweaty infrared blanket for over an hour. My body skin was tightened, moisturized, and truly glowing! All in all my body wrap/facial combo was an incredible experience that I would do over and over again. 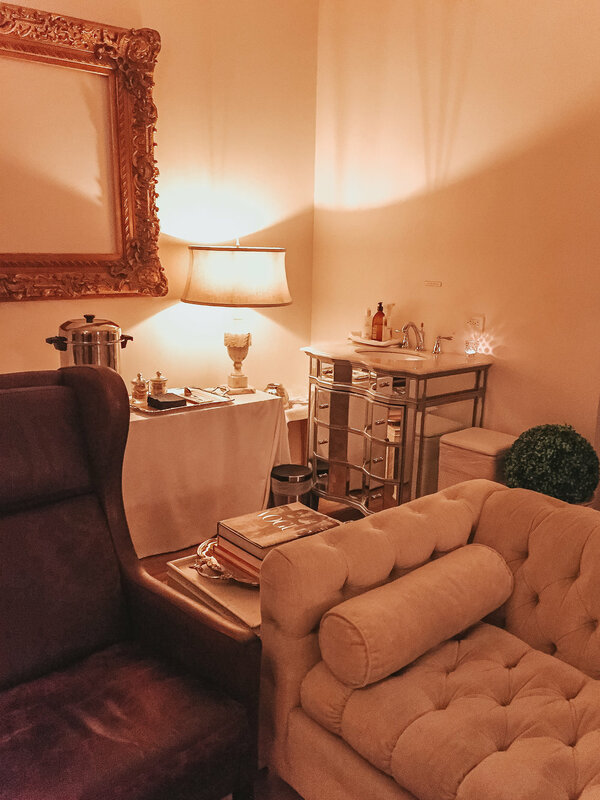 I would highly recommend Penelope and The Beauty Bar to anyone wanting a true luxury experience - perfect for bridal parties, birthdays, special occasions, or even just to pamper yourself for a day. As far as the microcurrent facial, I'd say that it really did work!! After doing some research, I learned that this is a treatment that has been around for almost 70 years, being used on patients with facial paralysis and Bell's palsy, but has only recently been adopted by the beauty industry. The results are pretty instant too, toning your facial muscles and truly lifting the entire face, which lasted all day for me! A few days later as I'm writing this, I can still see a difference in my skin tone and texture, though I'm not sure if it's entirely attributed to the mircocurrent, or more likely the facial experience as a whole. As for now, I'm looking into buying an at-home microcurrent machine on Amazon 😆 I truly think it made a huge difference in my skin and am excited to visit Penelope and The Beauty Bar again for future treatments!! Follow me on Instagram to keep up with my daily posts.